Well looky here. Seems Pikachu has finally made it on to the Smash Roster, and... what? He was already? All three previous games? Yes, I do live under a rock, sir. Though Pikachu's attacks may be old hash, he (she?) is still pulling out some new tricks in todays Smash Bros update. 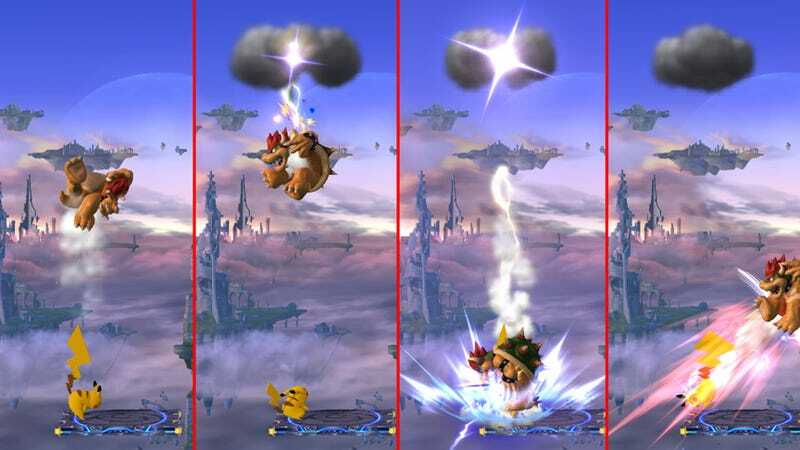 It appears that Pikachu's mighty thunder attack will now feature a thunder cloud and knock opponents straight down when hit. This is known as a "meteor smash" and it can be very useful when trying to KO opponents will little damage. The tricky part here will be hitting opponents with Pikachu's thunder attack while they hang outside of the ring, so as to propel them to their doom. Either way it's sure to set up some fantastic combos, like the one seen above.